This 212-page, fully illustrated book offers players and GMs a treasure trove of material for adventures revolving around the discovery and use of pact magic. Includes dozens of new bindable spirits, monstrous foes, spells, feats, traps and puzzles, terrain zones, magic items, adventure hooks, and adventure sites. Introduces the Exorcist, Muse, Ravaged Soul and Templar base classes, available for use as PCs or as inscrutable, recurrent villains that grow alongside PCs over multiple adventures. GMs will also find ready-to-run in-depth material on divine foes of binders—Penitent Hounds and Confessors—plus secrets of the ancient and arrogant Atlans, lurking cultists of the Nightfang Weald, and terror-inducing encounters with menacing cyclopes of the Outer Darkness. Meant for use with Secrets of Pact Magic. For use with D&D Edition 3.5. 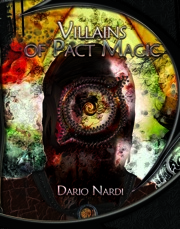 Note: Radiance House has published a FREE conversion guide to update Villains of Pact Magic for use with the Pathfinder Roleplaying Game. Just picked this up today, and I've got a question on the Purifiers. What's their alignment? It only says "Evil" on both of them. Even the hound and penitent are only "Evil". Hoping someone's going to check this. I'll forward your question to Dario, but I'm 99% sure that his intent was for the entire Purifier creature type to be Neutral Evil (NE). The lower level purifiers are evil (as in, any evil) and the higher level purifiers are specifically neutral evil. The exception in that chapter is the oracle, which is neutral, because it's not a purifier per see. And among purifiers, the spinster is specifically neutral evil even though it's medium level because it is sent on missions to act independently, requiring a certain amount of trust from its superiors. The notion might be slightly unfamiliar. This was a 3.5 product from 2008, not a Pathfinder RPG product, though it has an experimental layout for monster stats that looks a lot like a PF product -- great minds think alike? maybe! maybe? ;-). The book itself might not be PF, but the supplement is a PF conversion. I made sure to get both.